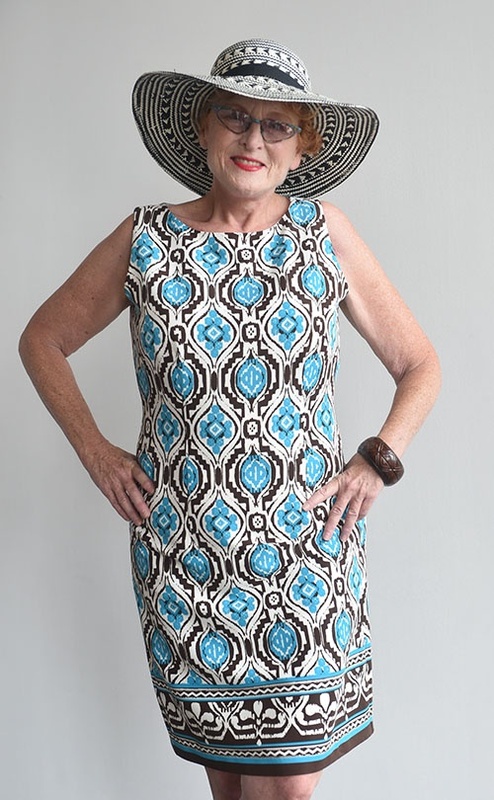 Catherine, our 2016 Amazing Looks Model Contest winner “dresses” up for summer with a statement dress! With a dress this fabulous from Jessica Howard ($7.99) you don’t need to add a lot more to make it fashion forward. Goodwill is a great place to find a dress that will take you through the events and parties of the season. The bold print in an interesting combination of blue, white and brown is flattering to Catherine’s figure, and the cut of the sleeves and neckline are just right without showing too much skin. The hat and bracelet add some elements of contrast without distracting from the overall look (hat $2.99, wooden bangle $1.99). Finishing the look off are her own white sandals that add comfort, as well as polish with this ultimate July look! Christopher is getting summer just right with this v-neck tee shirt from Mossimo ($2.99), that we tie-dyed ourselves using a kit found at the local Goodwill store. 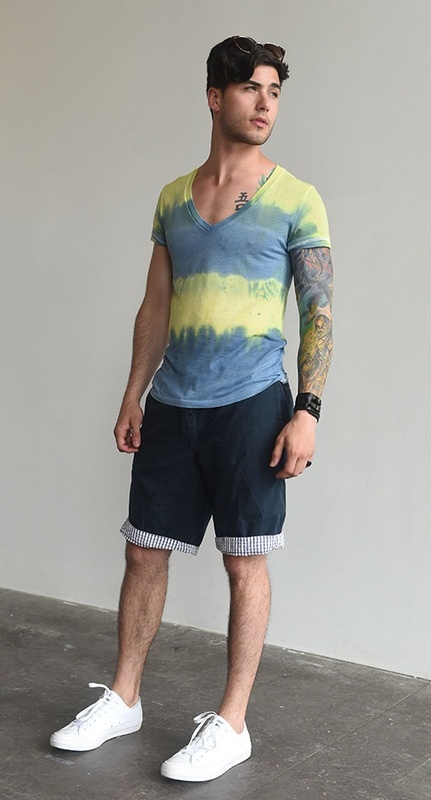 We rolled the shirt lengthwise and then did bold “stripes” of blue and yellow for a bright and fun warm-weather look. Shorts make the grade here as well in blue with striped seersucker lining. These can be worn with either side out, and they were a steal at just $3.99. We added some accessories like a ring ($4.99), sunglasses ($2.99), and black bracelet cuff ($2.99). The go-to summer accessory for men has to be the white tennis shoe, these are a Converse brand, and I found them for $24.99 NWT (new with tags), and they pulled it all together quite nicely. When the weather is hot, it’s important to have items like the ones Chris is wearing to take you to stylish places all season long!